Settings: Printed on a Replicator 2 with .3mm/low and normal support settings. 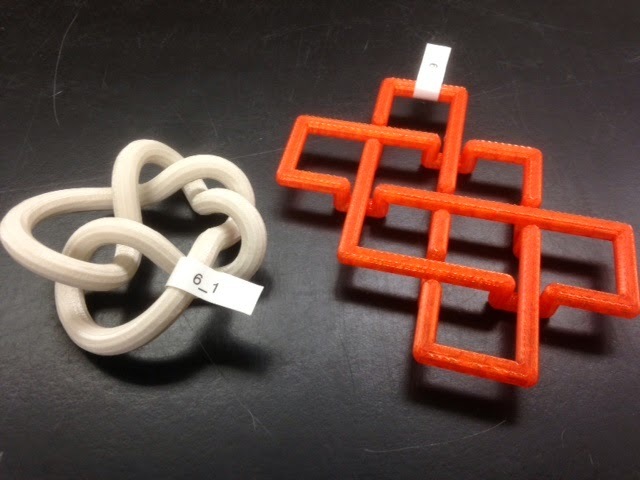 Technical notes, math flavor: This knot was designed and printed by JMU Student Taylor Meador. The images in her description below are from slides of a Knot Mosaic talk from Lew Ludwig of Denison College. Interestingly, as you can see in the figure, in order to realize a 5-mosaic projection of 6_1 we had to use an inefficient projection with seven crossings instead of six. In other words, in order to achieve a minimal mosaic number we had to use a projection with a non-minimal crossing number. (x,y,1) --> (x+1,y,1) --> (x+1,y,0) --> (x+3,y,0) --> (x+3,y,1) --> (x+4,y,1). The a and b parameters in the code allow us to scale the (x,y) plane separately from the z-axis, so that we can better adjust the clearance around and inside the crossings.